An E-bike like this deserves some fun rides and great scenery. Another thrill bike has come to me by way of NYCeWheels. You may remember the 3 months I spent with the raw-lacquer M3L Brompton last year. I wrote many articles about that bike and the fun I had with it. You can review them here on my pages and on my ’My Blogs on other Sites’ page if you like. Now an electric-assist Brompton H3L is mine to ride and report on. It’s bright white and equipped with hill-conquering power, and will be my companion for a while. The base of this E-bike is the new model H3L. It has a taller handlebar stem to allow a more upright seating position and to be more comfortable for taller riders. It is a three-speed bike with fenders. The electric-motor conversion is a custom modification that NYCeWheels has worked hard on to master. It is done so well that it almost looks and feels factory. The E-bike change-over doesn’t affect the fold at all. The ECU (electronic control unit) that is mounted on the handlebar stem does stick out an extra inch or so. Plus the extra weight is noticeable when carrying the bike and lifting it over obstacles. Some of the extra heft is the battery that is mounted in the removable ’C’ bag, so the carry weight is distributed between both hands when you are moving it. During a ride, that extra weight all but disappears. It sports a 250 watt brushless and gearless motor that is laced into the front wheel. It offers more that enough power for this lightweight folding bike. The direct-drive motor can be a little notchy feeling at very low speeds, but really smoothes out as you gain momentum. It is controlled by a thumb throttle at your left hand. The control panel lets you select one of three power levels, but at the full setting, the throttle still gives you full proportional control of the entire power range. The lithium battery is installed in the included ‘C’ bag. That still leaves room for many other carry items in its large pockets. The battery I received is the 10 Ah upgrade and is said to be good for 20 miles plus on each recharge. The separate zipper chamber that holds the battery has enough room to carry the charger too, so they are both isolated from the other pockets and the charger is at the ready wherever I go. The bag comes off easily with a simple latch and one electrical connector to un-plug. When NYCeWheels set out to add an electric motor to this great folding bike, they scoured the parts bins to come up with just the right combination of pieces. They come from over twenty different manufactures. From the important motor to the smallest connector, they have chosen well. They all blend together is a fashion that is very workable and pleasing to the eye. They offer this bike ready to ride or would be glad to do the conversion on the Brompton you already own. 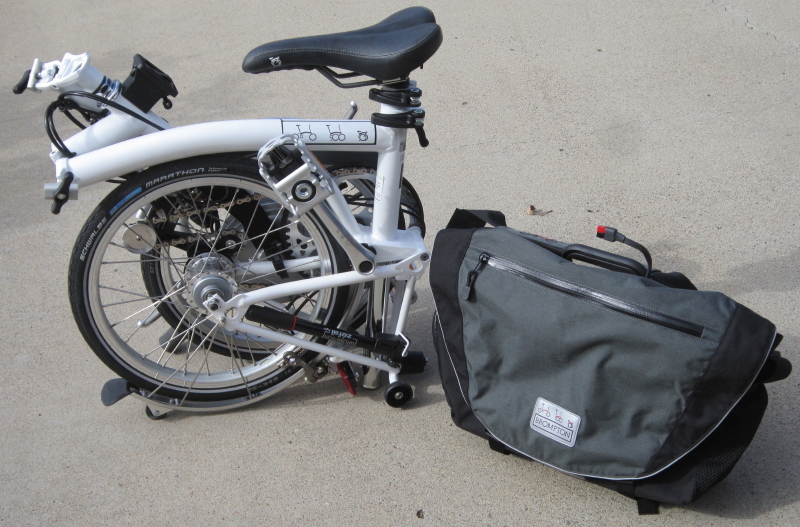 The base E-Brompton is a M3L in black or white with an 5.6 Ah battery. Of course, they will be glad to build yours with any or all of the options on their website. If you go hog wild with the extras list you will run up quite a tab. But why not, this fantastic bike is getting more popular everyday because it built so well, and the options can only make it that much better. This small package is ready to deliver large E-bike fun. Riding this bike is fun and comfortable. Folding it down always draws a crowd and everyone want to pick it up as if they are the one ready to take it on some far away trip. I have offered the controls to many friends so far, and they always come back smiling. For a bike that appears so miniature, it returns with a full-sized bike feel. And the benefits of a small folding bike become more obvious the more you ponder them. While you ride, you shift the three-speed rear hub with your right hand. It becomes very natural the more time you spend in the saddle. Your left thumb works the throttle and you can add as much or little assist as you feel is needed. With some time, your mind is more in control of the bike than your hands and feet. If you have ridden E-bikes before than you can relate to what I’m saying. If you haven’t, what are you waiting for? The power the motor adds is not a adrenalin rush, but more of a big smile kind of rush. I have had people not want to try my E-bikes for fear of doing some big wheelie, or the such. Once they do give it a try, they wonder what they were afraid of. The electric assist is just that, it assists your pedaling, not really replacing it. You can ride on the electric-motor power alone if you want, but it is best to pedal the bike normally and add motor power to overcome hills and the like. One bad thing about this unique E-bike is that you can’t just go to your local shop for a test ride. The shops that carry Bromptons are expanding in quantity all the time, but this is an NYCeWheels exclusive. You can be sure when you order one from them, they will back you up 100% with some of the best customer service this country’s bikes shops have to offer. If you happen to know me or see me on the bike path, just ask and I will let you take the reins for a ride you might not forget. But be careful, once you’ve ridden a bike like this, you are sure to want your own. You will see several articles with this E-bike included over the next few months. Plus I will be posting many stories on NYCeWheels’ website. I will add them on my page ’My Blogs on other Sites’ as they are published, so keep an eye out for those. “How can I convey the perfection of my comfort on the bicycle, the completeness of my union with her, the sweet responses she gave me at every particle of her frame? I felt that I had known her for many years and that she had known me and that we understood each other utterly.”—Flann O’Brien, The Third Policeman. 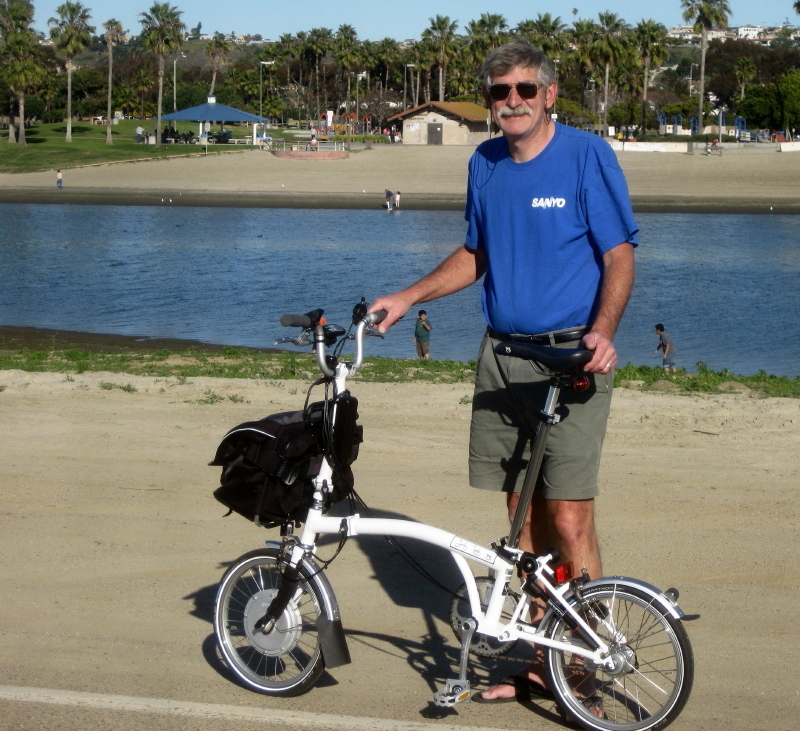 This entry was posted in E-bike test reviews, Folding Bike test reviews. Bookmark the permalink. Excellent article Bob and a good read. Thanks Mick, from a fellow Brompton lover, that is great praise. There will be more coming-up on this fun folder. I hope to ride with you next time I make it to London. In the mean time, I am so glad to be a member of the London Brompton Club.